Beast Horns are used obviously to spawn Bosses/beasts/DivineBeasts. 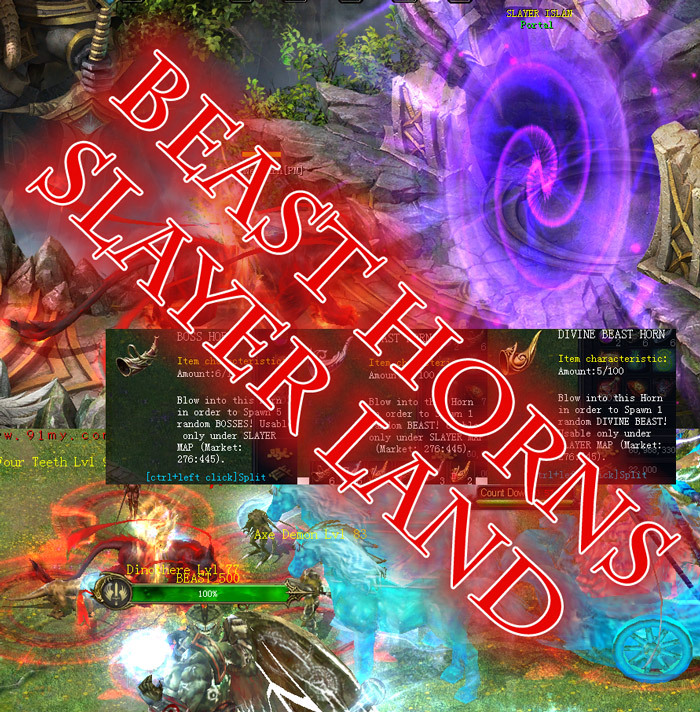 Horns can be used only at special maps for this action – Slayer Lands! Slayer Lands can be entered from market(276:445). – each slayer land can be used by Not more then 1 player! – After entering Slayer Land player has exactly 30 minutes to do his work – after this time will be moved out. Yes can later enter again – But must remember that if any monsters left on previous – can be not found later as entering maps is random! – Every horn has 1-3 minutes usage delay! – Horns can be obtained via Seth Shop and additionally via different ways (Beast Drops and not only). – There are 2 types of each horn – tradable and Not Tradable! 1 Comments ON " BEAST HORNS – Slayer Lands "